Earlier this week as I was walking back to my car through the student center at Eastern Michigan University, my ears immediately perked up as the faint echoes of a Chopin etude wafted down the hall. I was like a police dog picking up a scent trail. I had to go find the source of the music. And while the person playing the etude was only practicing and hit many wrong notes, to me it didn't matter. I was called to the music. To find the source of it. And to stop and listen for a while. Music moves me like nothing else on this earth does. There is a physiological and emotional response I experience when I encounter a beautiful melody, whether for the first time, or in this case, when I'm not expecting it. 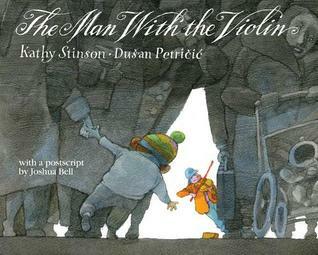 So it shocks and saddens me when I hear stories like the one in which this book is inspired: famous violinist, Joshua Bell, performed an experiment, proposed to him by Washington Post writer Gene Weingarten: What would happen if Bell, armed with his multi-million-dollar Stradivarius violin, dressed in jeans and a baseball cap, played for 45 minutes during rush hour in a busy D.C. metro station? How many people would stop and listen? Would anyone recognize his talent as more than just a mere street musician? This experiment occurred on January 12, 2007. During the 45 minute performance, Bell played a piece known as one of the most difficult ever written for the violin, "Chaconne" from Bach's Partita No. 2 in D Minor, as well as the emotionally stirring "Ave Maria" by Franz Schubert, and out of the 1,000 people who made their way through the metro station that morning, only seven people stopped to listen for more than a minute, Bell finding less than $40 in his violin case (when you discount the lady who dropped $20 in his case because she recognized him). What was most notable about this little social experiment was how often children, being dragged through the station by their frazzled parents, wanted to stop and listen, and could often be seen, turning their heads toward the source of the music, digging in their heels to prevent the beautiful sounds from wafting away. Dylan was someone who noticed things. His mom was someone who didn't. Dylan is a fictionalized boy, but he is based on truth given the number of children who wanted to stop and listen to the music that day in January 2007. The writing and the illustrations in this book are all quite wonderful, but for me it's the story itself that is so remarkable. To think that one of the best musicians in the world was just passed by and disregarded by virtually every commuter in the L'Enfant Plaza metro station that day, and already being familiar with what spine-tingling music Bell was playing, I just can't fathom how he went practically unnoticed. If I had been one of the D.C. commuters walking through the metro station on that January day back in 2007, I have absolutely no doubt I would have stopped to listen to the beautiful sounds of such a musical genius. No matter how much of a hurry I was in. But as I finished reading this book, I immediately released all of my emotions and began to cry because, even though I have no doubt I would have stopped to appreciate the brilliant music on that particular day or any day for that matter, I have to wonder what other life moments I am missing out on because I am too oblivious to notice. I know I am certainly guilty of commentating my way through life via the use of my smartphone that I very rarely just stop, put the phone down and allow myself to be present in the moment. It's stories like these that remind us all to stop and be present. Thank you Joshua Bell, Gene Wingarten, Kathy Stinson, and Dusan Petricic for helping to remind me. LOVED this review Beth. Thank you!